Any college teacher knows that students are attached to their cell phones. A new study measures just how attached they are. “The Invisible Addiction: Cell Phone Activities and Addiction Among Male and Female College Students,” published in the Journal of Behavioral Addictions, found that college women spend an average of ten hours daily on their cell phones; college men spend nearly eight. Students’ attachments to their phones was so great, in fact, that both male and female students admitted to feeling “agitated” when their devices were not within sight. Technical addictions have been explained as a type of behavioral addiction—a compulsion to continue a behavior in spite of its negative impact on the user’s well-being. Addiction to cell phones occurs over time, the researchers explain, usually beginning with benign use that eventually causes negative consequences and increases dependence. For example, a phone originally purchased primarily for safety reasons becomes used entirely to send text messages and check social media sites. The cell phone user eventually reaches a tipping point where use of the device becomes uncontrollable—being unable to stop texting while driving, for example—and causing negative consequences. Interestingly, the ways in which students rely on their phones are somewhat counterintuitive. Traditionally addictive activities—such as gaming—were not the causes of cell phone reliance. Rather, students spent the greatest majority of time texting (94.6 minutes daily), followed by e-mailing (48.5 minutes), checking Facebook (38.6 minutes), surfing the Internet (34.4 minutes), and listening to their iPods (26.9 minutes). The study’s authors surmised that female students spent more time on their cell phones to build relationships or have conversations by texting and e-mailing. The men, while sending the same number of e-mails, spent less time on each message, suggesting their messages were more utilitarian in nature. Men also spent time checking Facebook, Instagram, and Twitter primarily to follow sports or news or simply to kill time. 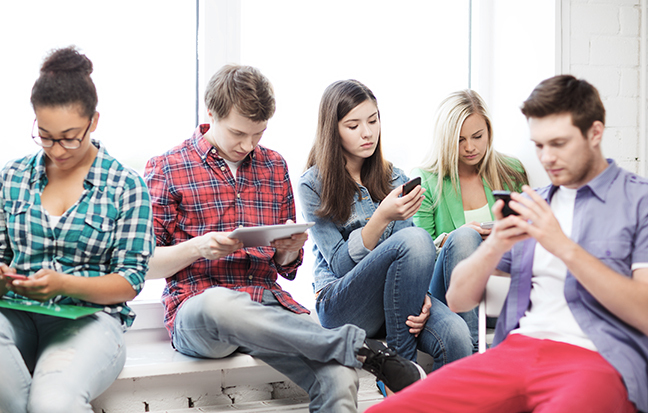 Excessive or addictive cell phone use by students carries negative implications. The devices cause students to lose focus in the classroom and in some cases provide opportunities to cheat. Compulsive cell phone use can also cause conflict in and out of the classroom, the study found. Cell phones, when used to dodge uncomfortable situations, can also lead to negative outcomes. The study’s authors conclude by suggesting that researchers continue to look for the “tipping point” as to when cell phone use becomes cell phone addiction. The researchers call cell phone use a “paradox of technology” because it can be both freeing and enslaving. How are cell phones “freeing and enslaving”? How might excessive cell phone use create negative consequences in the workplace? Addictions are often caused when an individual wants to escape painful or negative feelings. How does cell phone addiction fit this explanation? This entry was posted in 3. News You Can Use and tagged cell phones, college students, student behavior on February 3, 2015 by bizcombuzz.